Laura Mercier Nail Lacquer creates beautifully manicured nails with long-lasting, chip-resistant, protective color and high shine. The ultra-smooth pigment enhances any nails and a fast-drying element expedites the drying process. LAURA MERCIER NAIL LACQUER in FLAMINGO is a beautiful creamy bright pink color with no shimmer that was first available in the Spring Tres Chic 2012 collection. To my knowledge, I believe this color is no longer available which is a shame. It is such a beautiful shade of pink that even though its considered a bright pink it can still be work appropriate. It is that versatile. Also this polish is very pigmented and is extremely long lasting. I can get about a week to two weeks normal wear time with no chipping. When I first saw Flamingo it reminded me of the main character from the Legally Blonde movies, Elle Woods. Her signature color was pink and just about everything she wore was pink. If you haven't seen the movies then you really need to watch them. They are so funny and kinda corny but I love them! Anyway, this color is exactly what I would expect her to wear. I think it can best be described as a "Barbie Pink". 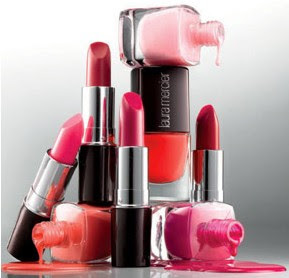 Laura Mercier nailpolishes currently retail at $18.00 for .35 oz. Limited Edition. The ultra-smooth formula provides chip-resistant, fast-drying and long-lasting color. Nail Lacquer does not contain formaldehyde, toluene, or dibutyl phthalate (DBP).